This is a really interesting range of insulation solutions. It covers the classic (loft) the intensive (internal wall insulation) and the budget options available for a retrofit. I was recently working out the carbon footprint of Green Cottage, and came up with a very favourable figure of less than one tonne of CO2 a year – this being associated with the grid electricity I use. I’m with Good Energy who use 100% renewable energy, but for the purposes of counting I take the figure for normal grid electricity as that’s what comes to my meter. I was quite pleased with this – but the figure doesn’t tell the whole story. My heating in the winter is wood fuel, and in a cold winter I tend to use a LOT of it – maybe 6 tonnes or more during one of the bitterly cold winters we had a couple of years back. I don’t really feel comfortable with this – for a terraced house it seems excessive, and unsustainable. I’ve been interested in the potential for micro-hydro for ages but never been able to find a suitable system that would work with the large head, small flow streams that many smallholdings would have. A couple of weeks ago I was working at the Royal Welsh Agricultural Show as part of my role with the Horticulture Wales project, imagine my surprise then when I saw this in the same tent as our stand! It’s a 7kW system, put together by a really interesting not-for-profit group called The Green Valleys. 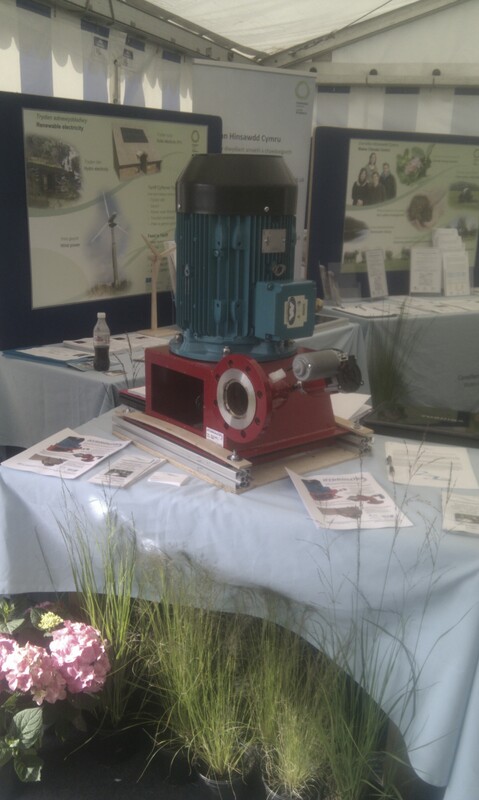 They spend their time helping landowners to install micro-hydro and have a range of systems from 1.5kW upwards. There are a lot of challenges – the cost of pipes and grid connections amongst them – but the economics are really very interesting. Not bad! And when you consider that a simple installation would start from £25k, it could be a fantastic investment. And that’s before you even consider the environmental benefits that come from producing 61.3 MW of green electricity each year! Seeking top climate change warriors in Trafford! We’ve just had a great visit from Action for Sustainable Living. They’re a really inspirational local charity working on building a sustainable future in Machester and Trafford – they’ve even been nationally recognised for their work, winning the 2008 National Guardian Charity Awards. They’re looking out for local people who are passionate about making their communities a better place, so we said we’d help get the word out! Volunteering with Action for Sustainable Living is a good way to gain amazing work experience with an award winning charity. As a volunteer you’ll make a massive difference in your local community by designing and implementing a sustainable project. They’re looking for Local Project Managers to cover Stretford, Urmston and Sale areas, complementing the volunteers they already have throughout Trafford. The role is a challenging yet rewarding one; you will develop new skills, meet new people and really feel like you are making a difference. If you are an enthusiastic, self-motivated individual able to offer at least eight hours per week to support AfSL’s activities, why not nominate yourself for this unique opportunity? ‘To me, the 8 hours per week that I contribute to Action for Sustainable Living are more meaningful than a full-time job in any non-sustainable organisation’. Local Project Managers attend events, give talks and workshops and set up local action groups and projects (Don’t worry! AfSL will help you get ready for these). Previous Local Project Managers have set up community allotment projects, fair trade societies, energy action teams, composting schemes, local shop campaigns and a whole range of interesting, locally-relevant things. You just need to be able to commit eight hours a week for six months or more. You do need to apply – the deadline for applications is on Friday 18th September at 12pm, and if you’re interested in finding out more you can contact AfSL (details below) or attend the LPM Introduction evening on Thurs 17th Sept at 5:30pm (contact them to confirm your place). Carrot Root Fly has a limited altitude – it can’t fly higher than 18-24 inches (depending on which site you believe).